This fixed temperature thermostat, EFR, with either a normally open (NO) or normally closed (NC) contact is used to control installed devices, such as filer fans or fan heaters, to turn on or off when required. The result is a reduction of operational cost. A pre-set temperature limit prevents unauthorised personnel from tampering with the thermostat. Pre-set thermostats to manage temperature in panels. Sensor element thermostatic bimetal. Red one (EFR202) with a normally closed contact for regulating heaters. Blue one (EFR201) with a normally opened contact for regulating cooling devices or signal devices. Mounting clip for 35 mm DIN rail (EN 60715). 250V AC, 5 (1.6) A. 120 V AC, 10 (2) A. 24 V DC, 30 W. Value in brackets for inductive load. Max. starting current of 16 A (AC) for 10 seconds. -40 °C to +80 °C. 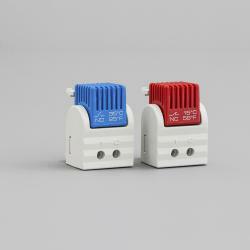 2 pole terminal for 2.5 mm², torque 0.8 Nm max. Fixed temperature thermostat, with either a normally open (NO) or normally closed (NC) contact. The pre-set thermostat allows energy to flow to a device when the temperature threshold has been exceeded (NO variant), or when the internal temperature has dropped below the threshold (NC variant). The installed devices, such as filter fans or fan heaters, automatically turn on or off when they are required, which reduces the operational cost of the control panel. The pre-set temperature limit, avoids tampering by unauthorised personnel. The thermostat with a normally open contact (EFR201), is used to control cooling or high temperature alarms, and the thermostat with a normally closed contact (EFR202), is used to control heating.